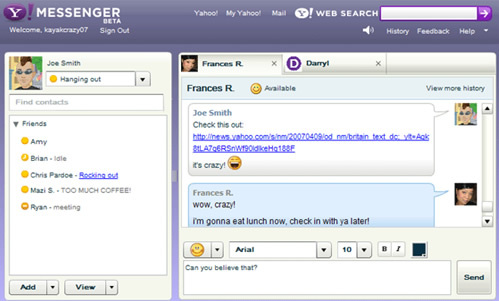 Web Yahoo Messenger came for all of us who can’t use messenger in their offices, it can be accessed from http://webmessenger.yahoo.com or from shorter url http://web.im. The Interface built with flash and visually appealing. Not all of the desktop messenger features available but important features like emoticons and avatars are supported. Webmessenger can be used in both Windows and Mac, it supports IE, Firefox, Netscape, Opera and Safari. International versions of web messenger available for United States, Brazil, India, Philippines, Malaysia Vietnam. Is this is the end for other web IMs like Meebo and eBuddy, I dont think so, still i like Meebo, what makes meebo a winner is its ability to connect to different IMs and different yahoo Ids. But if they can add VOIP to web version then it would be really useful.